Organizers for the contest, held every four years, received submissions from 44 countries. More than 600 applications from 44 countries have been submitted to the 15th International Tchaikovsky Competition, a classical music competition for pianists, violinists, cellists and vocalists held every four years. Cash prizes are awarded to the top five competitors in each of the instrumental categories and to the top four male and female vocalists. More than 200 of the applications were from Russia. Eighty-nine were from South Korea, 54 from China and 38 from Japan. Thirty applications were received from the United States along with 16 from France, 12 each from Germany and Italy, and 3 from the UK. “Our winners will have exclusive opportunities in Europe, Russia, Asia, and in America,” Gergiev said in an interview with Russian daily Rossiyskaya Gazeta. “And these opportunities will be even better than for winners of the previous competitions. We held a meeting in Carnegie Hall, and we've got guarantees that winners will perform there”. “We will see traditionally strong schools: The Italian and French cello schools, the South Korean vocal school, and others. I think Russian vocalists will look good. In the last 15-20 years, our presence in the leading world theaters is indisputable. So the 15th Tchaikovsky Competition will reflect music world such as it is today". 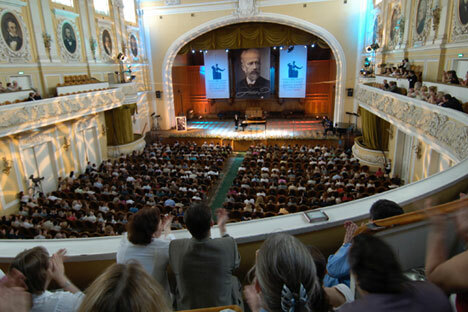 The International Tchaikovsky Competition is held once every four years. The first, in 1958, included two disciplines – piano and violin. American pianist Van Cliburn achieved worldwide recognition when he won that competition at the age of 23 at the height of the Cold War. Beginning with the second competition, in 1962, a cello category was added, and the vocal division was introduced during the third competition in 1966. In 1990, a fifth discipline was announced for the IX International Tchaikovsky Competition — a contest for violinmakers, which is held before the main competition.